Everest Helidown Trek, an iconic journey to the Everest base camp of the world's highest mountain and fly back Lobuche to Kathmandu on chartered private helicopter. Some trekkers do not have the time or the physical capacity to trek to and from the Everest Base Camp. Since it is a challenging trek, some people prefer to take a Everest Base Camp Heli Down Trek. Everest Base Camp Helicopter Trek provides this option to trekkers who prefer to plan their trip this way. We will be trekking through small trading villages and past ancient Tengboche monasteries as we journey towards the Khumbu Glacier. When we reach Everest Base Camp we will also include a trek to Kala Pathar (5643m) with its legendary views of Mount Everest itself. Afterwards we will trek down to periche and board our private charter helicopter and head down the Khumbu on what is surely one of the most scenic helicopter rides on the planet. If you are short on time but still need the adventure of reaching Everest Base Camp, then our Everest Heli Down Trek is perfect for you. Board exhilarating Trans-Himalayan Kathmandu Lukla flight and witness spectacular Himalayan panorama. Discover the age-old lifestyles and traditions of Himalayan Sherpa community. Visit the Tengboche Monastery at 3860m, one of the biggest monasteries in Khumbu region. Witness the mixture of rich Buddhist & Tibetan cultures and traditions. Hike to Kalapathar at 5,550 meters with spectacular views Mt. Everest including other Khumbu giants. This 11 Days Everest Heli Trek will take you in the footsteps of Sir Edmund Hillary and Tenzing Norgay to the southern face of Mount Everest, the world’s highest mountain. There is no compromise on safety in this Everest base camp helicopter trek as we have crafted the ascent so that you will acclimatize as best you can. This is a spectacular Deluxe Everest Trek for those that have limited time to reach the base of the world’s highest peak, Everest!. Everest base camp heli trek is one of the most sought after activities. It is the dream of every adventure enthusiasts to set foot in the land of highest mountain in the world at least once in their lifetime. 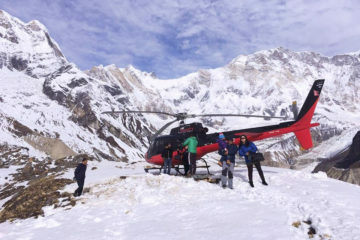 This is the luxurious helicopter tour to Everest that enables you to explore Everest in far less time in comparison to classical 14 day Everest Base Camp Trek. This is definitely a dream destination for thrill seekers and adventure lovers. However, not everyone has the time to finish the entire trek. The Everest Helicopter Trek is a 11 day tour that allows you to experience the whole trek going to the Everest Base Camp, but return on helicopter. 10 Nights / 11 Days. Kathmandu, Lukla, Namche, Everest Base Camp, Kalapattar. Special Notice: Due to unpredictable weather conditions in the Himalayas, there may be unforeseen schedule changes in domestic flights to Lukla and from Lukla. The flights may be delayed for several hours or pushed back by a day or more, depending on the circumstances. Although this is rare, it can happen even during the best trekking seasons. As you know, high altitude weather conditions can be difficult to predict. Therefore, we strongly suggest that you plan for this by allowing for an extra day or two in Nepal after your trek, if possible. This will help ensure that you have some flexibility with regard to your trek. On the other hand, if everything goes according to plan, you will have time to enjoy other activities such as rafting, wildlife viewing, shopping, or just relaxing after your adventure. When you arrive at the airport, Nepal Tours representative will be there to pick you up and bring you to the hotel. Depending on when you arrive, you’ll go through an orientation on the Evening. After landing in Lukla’s tiny airport, embark on a gentle, 3 hour hike to Phakding. The mainly downhill trek leads you through colourful and fragrant forests of pine, magnolia and rhododendron, past several small Buddhist settlements with their pearl white stupas, ornate prayer wheels, piles of mani stones and colourful flags flapping in the breeze. Soak up the intoxicating beauty of the valley as you cross the swirling ice-water of the Dudh Kosi or ‘Milk River’ by suspension bridge, before arriving in the small village Phakding, where you lodge tonight. After leaving Phakding, we will cross the same river several times over high suspension bridges. It helps to avoid thinking about Indiana Jones movies here! Soon, we’ll pass Monjo and enter the Sagarmatha National Park. Once inside the Park the trail becomes steep, rising to Namche. Namche Bazaar is the chief trading village for the region, and an excellent place to find a few last Western luxuries, including Illy coffee and some amazing brownies! Better still, on a clear day you can see Everest itself from here. Today we take a day off from our journey to become acclimatised and further explore Namche Bazaar and the surrounding area. With its collection of artefacts, photos and archives chronicling Sherpa Everest climbing expeditions, a trip to the Sherwi Khangba Centre provides a fascinating insight into the history of the Sherpa culture in the Everest region. The Khumbu International Library, located within the Centre, features an ever expanding selection of books, magazines and videos dedicated to every aspect of Nepalese mountain life from flora and fauna to agricultural techniques. Sagarmatha National Park Headquarters offers an interesting display of photos, memorabilia and information about the park and the spectacular views of the snow-swept ridges of Ama Dablam, Kwangde, Thamserku and Kangtega are not to be missed. We’ll continue to follow the valley above the Dudh Koshi, and be treated to amazing views of Everest, as well as Lhotse, Nuptse and Ama Dablam along the way. We’ll cross another high bridge at the village of Phunki Tenga, where we will stop for lunch. After a brief rest, we have a steep climb to Tengboche, the site of the largest gompa (Buddhist monastery) in the region. Day six takes us back down into the forest, and across the Imja Khola. Once across, we’ll climb up to Pangboche village and more stunning views of what seems like the entire Himalaya. We’ll continue upwards to the HRA’s first aid post at Pheriche, and be able to attend a lecture on avoiding altitude sickness (which we really do advise you to attend). In order to help with your acclimatisation and prepare you for the higher portions of the trek, we will arrange an excursion to see Tshola Lake and the Tawache and Cholatse Walls. The short trek will take us up the ridge over Dingboche, where we’ll be able to see the Imja Valley spread beneath us, and the south face of Lhotse in the distance. Today we begin the main trek again, climbing the steep Khumbu Glacier with Tawache and Cholatse peaks overhead. The boulder-strewn terminal moraine makes interesting and rugged terrain, and the top of the glacier is marked with numerous cairns, left to mark the passage of the Sherpas and climbers who have died conquering Everest. At the glacier’s top, the path levels out to a very gentle climb to Lobuche. The trail now leads along the Khumbu Glacier, providing excellent vistas of the Himalayan peaks nearby. Lunch is at Gorak Shep, and then we are back on the trail for a few hours until we reach Everest Base Camp. We will pass lesser glaciers, ice pinnacles, and the sometimes dangerous crevasses of the Khumbu along the way. The return trip to Gorak Shep is made along a higher path overlooking the Khumbu icefall and the South Col route. Today, a private helicopter will transport you back to Kathmandu, bringing your Everest adventure to a spectacular close. Enjoy free time in Kathmandu for the rest of the day, perhaps heading to the beautiful Garden of Dreams to unwind among tranquil lily ponds and verdant lawns, or venturing to iconic hippy destination Freak Street to browse the many art, trinket and book shops. Lunch and Dinner your stay in Kathmandu. All kind of drinks (Alcoholic, hot and cold drinks). Our daughter surprised us by an invitation to an exciting Everest base camp trek helicopter trek in March during his Thanks Giving holidays in Nepal. During and along the entire Everest Base Camp Heli Down Trek – 11 Days, on the path or in the tea houses, Kulendra with extreme kindness always checked we were getting the best of the incredible experience. We are very grateful to the Nepal Tours team and especially to Kulendra. We highly recommend them to everyone. We booked our 11 days Everest heli down trek with Nepal Tours as they response my email very quick, all the positive reviews online and best price they offer me. So, if you are thinking of going to Nepal, you are highly recommended this company. The Everest base camp helicopter trek was very well organized and very professionally run. The guide (Sancha) and porter (hari) are very knowledgeable and professional as well as being really friendly with lots of jokes and laughs. They really did become part of our family while we were on trek.